It was with trepidation that I accompanied Marysia and Ian to Twinkle Toes to have him fitted for his first pair of shoes. Shoes are, like many things in life, both a step forwards and a step backwards (step – hah!). They allow you to walk over rough pavement and stickers, but they confine your toes uncomfortably and make them sweat. Plus, you often have to go to a mall (shudder) to purchase them. There’s no avoiding shoes, of course, and so on 18 Steptember, the week before Ian’s first birthday, we struck out for University Mall to find him some shoes. And, at first, we failed. Sears had no salesperson to help us figure out Ian’s shoe size. Parisian’s had a crummy selection. We abandoned the mall and drove to a speciality store for children’s shoes, Twinkle Toes. There the owner, Lisa, personally fitted Ian for a pair of Stride Rites. Could we get the damn things on his feet? Twinkle Toes and Stride Rite, one of the oldest children’s shoe companies, provided just what we needed. Plus, despite the misspelling, you’ve got to love that name: Stride Rite! Ian took to his new shoes pretty quickly, although there was definitely a period of adjustment during which he walked like Frankenstein’s monster. But now, just 11 days later, he’s walking as if he’d worn shoes all his life! Until Ian came along, I never really appreciated physical humor. Ian just loves it. Nothing makes him laugh as much as knocking heads, pillow fights, and belly farts. Ian likes being tapped with his spoon. He likes running (waddling, really) away so he can be caught. He goes into the studio (which is off limits because of the cat box) and than laughs loudly waiting for us to carry him out of there. His teacher Rachel says he likes to belly flop into the bean bag chair and make the other kids laugh. He also likes putting things like a plastic bowl on his head, also to make people laugh. I suspect he inherited this sense of humor from his dad. Jeremy doesn’t usually put bowls on his head, but certainly can tell funny stories. We finally got our power back–about four hours after my post yesterday. We were powerless a total of 36 hours. Long enough to turn everything in our freezer into mush. Fortunately, we were able to take our valuable cache of frozen breast milk to Gary Copeland’s freezer before it defrosted. Ian was a little trouper through most of the “ordeal.” He didn’t seem to miss electricity at all and he got to skip day care and spend two extra days at home with Mom and Dad. We spent an hour cleaning tree debris from the yard, with Ian supervising from his stroller. We didn’t have any real damage, but a good sized limb–probably 6 or 7 feet–fell directly on the roof. The roof is so steeply pitched that it mostly glanced off it, which is a good thing because it’s an asbestos slate roof (dating from 1930!) that would be quite difficult to repair. But, the best I can tell, the limb just scraped a bit of moss off and then rolled harmlessly against the chimney. 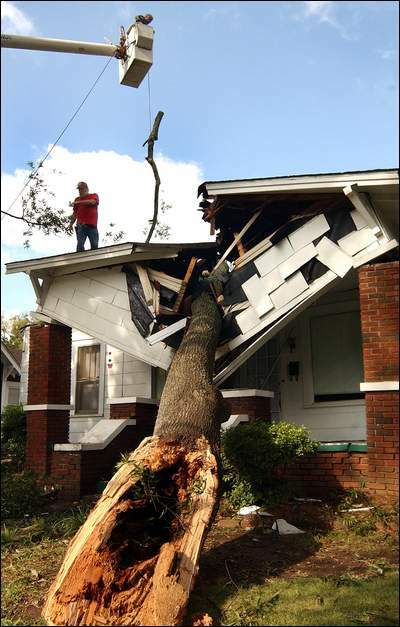 That limb falling and this picture from TuscaloosaNews.com of Ivan aftermath illustrate why one retreats to the basement when high winds blow in Alabama. Marysia points out that Ivan, Jan, John and Ian are essentially the same name in different languages. ‘Course, we already knew that Ian was a miniature hurricane of destruction. Walking through our house most afternoons will confirm that. Hurricane Ivan tore through the state of Alabama yesterday–giving Ian his first weather emergency and his first major power outage. 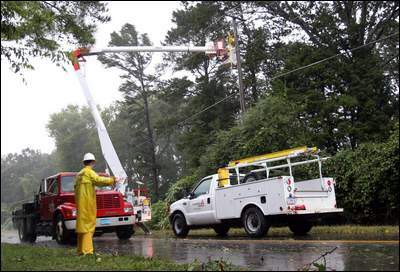 Most of the Tuscaloosa-Northport metroplex is back on the grid, but not Bellwood. This photo is of a work crew restoring power not in our neighborhood. I swear, the moment a robin sneezes near a power line we lose electricity. It went out sometime before 5:00 a.m. Thursday morning–before I could brew my morning coffee! Came back on briefly at 7:30 and has been out ever since. Alabama Power reports that 825,000 customers are without power–out of a total of 1,300,000. That’s 63% statewide! The biggest outage they ever had before was about 450,000! So we’re guessing that lil ol’ Bellwood is pretty low on the priority list. I called AP to report the outage and their automated system told me it’d be restored by 5:00 p.m…. September 21st. Five days from now! The galling thing is that the outage is so spotty. There are houses less than 50 yards from us that have power. Misery loves company and we don’t have much when it comes to lack of power. Odd thing is, the rainfall wasn’t that much. Less than an inch, according to Weather.com. It was really just like a normal rainy day, with a bit more wind than average. The big stuff was a little east of us. We really dodged a bullet here. Fortunately, it was fairly cool yesterday, but today the temps should be in the mid-80s. It’s going to get pretty uncomfortable in our little house without air conditioning. If it weren’t for Ian, we’d be camping out in movie theaters. Hell, if it gets too warm we may yet be. Dad sent us an article about parents making blogs of their kids. So, Blog Ian is not exactly unique, but it is, of course, one of the better blogs about one of the cuter babies. When co-workers ask Alecia Davis if she has any photos of her baby son, Colum, she doesn’t pull out her wallet – instead, she sits down at the computer and logs on to her baby’s personal Web site. Baby Colum’s site is actually an online diary – a Web log – kept by his dad, John Davis, a stay-at-home father who is also an English teacher. Besides photos, the site also includes regular entries about daily life, comments from readers, poems and statistics (number of teeth, height, weight, etc.). It is a grandma’s paradise. But the funny thing is, it’s not just friends or family who log on to the site to look at 10-month-old Colum’s latest candid photo. Strangers do, too (often other parents). In fact, a whole community of parents from across the globe has gathered on the Internet to share stories and advice and musings about parenting small children. Many are doing this via Web logs – also known as baby blogs. “I haven’t written in Olivia’s paper journal for months and months and months, but I’m on the computer all the time, checking my e-mail, making a note about our day (on her online journal), taking a break to see what that 2-year-old in New Jersey is up to,” says Julia Janousek of Minneapolis, a mom to 2-year-old Olivia and 6-week-old Xavier. Janousek belongs to Live Journal, a Web site that helps people create and maintain online diaries. As part of that service, Janousek can link to the Web logs of “friends” she has discovered on the site – in her case, that includes parents who have children about the same age as hers. “I started this as a way to talk to other moms,” Janousek says. “I’ll write that Olivia will only eat cereal out of my bowl, and I’ll get comments like, ‘Oh, yeah, that happens at my house, too.’ It’s almost like real-time advice. Clancy Ratliff, a student of rhetoric and feminist studies, is studying the Web logs of mothers for her doctoral dissertation at the University of Minnesota. Ratliff said she got to thinking about how Web logs that discuss the Iraq war and the upcoming U.S. presidential election – often written by men – get as many as tens of thousands hits a day, but that the Internet audience is not as wide for the women who write online about politics in a more personal, everyday-life kind of way, such as parental leave policies of corporations. In a way, these blogs are documenting everyday history: “These people are talking about the daily work of motherhood,” Ratliff says. Kelly Brown, a mom and a blogger, realizes the importance of parents sharing their daily life. Brown founded bloggingmommies.com in 2000, which links to about 850 Web logs of moms and yes, even some dads. They include everyone from pregnant moms to moms detailing life with a newborn to women seeking to adopt a child. Ian has been battling an ear infection this week. It’s sorta his first. Dr. Clark had previously found a little “water” on an Ian ear several months ago and had prescribed antibiotics; but she wasn’t definite about it being a true infection. This week, however, the lil dude is unambiguously suffering. Last Monday he had a low-grade fever most of the day and had to be brought home from day care. At about 4:30, the fever suddenly spiked–eventually hitting a high of 104.1 degrees (Fahrenheit). We called the doctor’s office and they said to take him to the emergency room. So, off we went to the Northport Medical Center, where Ian was born 11 months ago. The process was sloooooow (when is it not at the ER? ), but thorough. They took a blood sample and a chest x-ray. Peered in his ears, nose and mouth. Thumped his chest. Took his temperature rectally (ew!) and gave him some Motrin that brought it down surprisingly quickly. Finally, after three hours, Dr. Rodolfo Veluz declared that Ian’s right ear was “definitely infected” (actually, the doctor that said that was a man whose name I didn’t catch, but Dr. Veluz’s name was on the records). Antibiotics was (were?) prescribed and we were free (yes, free at last!) to go home. Actually, although three hours in the ER is not a time-efficient or pleasurable experience for anyone, the NMC was good about getting Ian into a private room within about 15 minutes after our arrival–taking him inside ahead of several other folks that were waiting. I guess they give feverish babies a high priority. Since Monday, Ian’s fever has slowly been subsiding–although not in a linear fashion. It would go down for several hours and then spike back up again, once getting as high as 103 in the middle of the night. Those relapses are frustrating, but they’re becoming less common as the week goes on. Yesterday, Thursday, he had hardly any fever at all; but he still wasn’t his old carefree self. It was evident that he was feeling pain even though he did not complain too much. He also went back to day care Thursday for the first time since Monday morning (after we got a return-to-school note from the ER that certified that he was not contagious). One of the challenges for Marysia and me (beyond the intense worry over a sick child) has been juggling our work schedules so that one of us can be home with him at all times. It’s the first time we’ve had to do this for the better part of a week. It feels odd to be taking “sick days” when the person who’s sick is not yourself, but I guess that’s all part of being a parent. Now, Friday morning, Ian is on the mend. He has not been feverish for 24 hours, but he’s still evidently in discomfort. Hopefully that’s just another step in the recuperation process. And on a mostly unrelated note (although an essential part of the Ian story in the long run), Marysia and I will celebrate the 60-month anniversary (five years!) of our first date at the Globe restaurant tomorrrow. Without that date and the subsequent events, Ian would never have existed!